MAVROULES, Nicholas James, a Representative from Massachusetts; born in Peabody, Essex County, Mass., November 1, 1929; graduated from Peabody High School., Peabody, Mass. 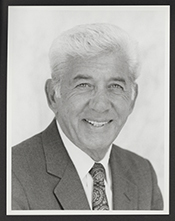 ; employed by GTE-Sylvania, 1949-1967, and served as supervisor of personnel; city councilor, Peabody, Mass., 1958-1965; mayor of Peabody, Mass., 1967-1978; delegate, Democratic National Convention, 1975; elected as a Democrat to the Ninety-sixth and to the six succeeding Congresses (January 3, 1979-January 3, 1993); unsuccessful candidate for reelection to the One Hundred Third Congress in 1992; died on December 25, 2003, in Salem, Mass. ; interment in Cedar Grove Cemetery, Peabody, Mass.